CHARLOTTETOWN, PEI. 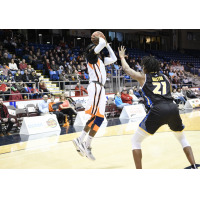 - T.J. Maston hit a fade-away jumper with .2 seconds left to give the Saint John Riptide a thrilling 87-85 win over the Island Storm on Thursday. The Storm's Kareem Canty had drained a three-pointer four seconds earlier setting the stage for Maston's heroics. The 6-foot-9 centre from Dallas, Texas, led the Riptide with 25 points, 12 rebounds and three blocked shots. Chris Early scored 17 points while Jeremiah Mordi added 12. Kemy Osse chipped in with 11 points for the Riptide, who improved to 6-12 on the National Basketball League of Canada season. Sampson Carter was the top scorer with 20 for the Storm, who fell to 4-12. Canty added 14 points. With the win, Saint John moves a game ahead of the Storm in the Atlantic Division standings. Canadian forward Jayln Pennie made his Riptide debut on Thursday, going scoreless in three minutes of court time. The team released Renaldo Dixon to make room for Pennie. The Storm led 61-60 after three quarters, 37-36 at the half, and 22-20 after one quarter. For the game, Saint John shot 37 per cent from the field, connecting on 8-23 three-point attempts. The Storm hit on 36 per cent of their attempts and went 9-31 from deep. The fourth-place 'Tide travel to Cape Breton Sunday to take on the Highlanders, 14-7. Cape Breton has won three straight to take over first place in the Atlantic, while the Riptide have fashioned a two-game winning streak of their own. The 'Tide return home on Wednesday, January 23rd to face the Sudbury 5. The next night, they'll be back on the Harbour Station hardwood against the Windsor Express. Tip off is 7 p.m. for both contests.